Indian Navy is inviting online Government job application from 10+2 pass candidates. Indian Navy recruitment department conduct this examination for 10+2 Cadet Entry Scheme every year. An official notification is out from the Indian Navy Department in which they said that they are going to conduct Indian Navy Cadet Entry Scheme examination for the year 2019. So those who are looking for the Indian Navy jobs can apply for this cadet entry scheme. More information related these Navy jobs as an officers for 12th pass candidates is given below in this article. Read the complete article very carefully before applying online for this Indian Navy Recruitment process 2019. Number of Vacancies: Not Specified in the Notification. Pay Band: Rs.83448 Per Month. Educational Standards: Those who have passed in their 12th class examination with 70% marks in an aggregate can apply. But candidates must have completed their 12th class examination in SCIENCE Stream including Physics, Chemistry and Mathematics Subjects. 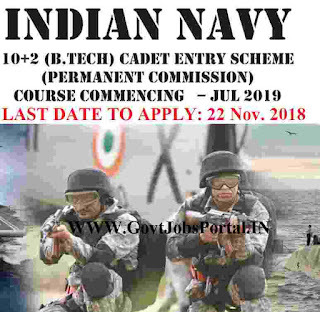 Age Bond: Those who born in between following Dates: 02 Jan 2000 and 01 Jan 2002 (both dates inclusive) can apply for this Indian Navy 10+2 Cadet Entry Scheme 2019. 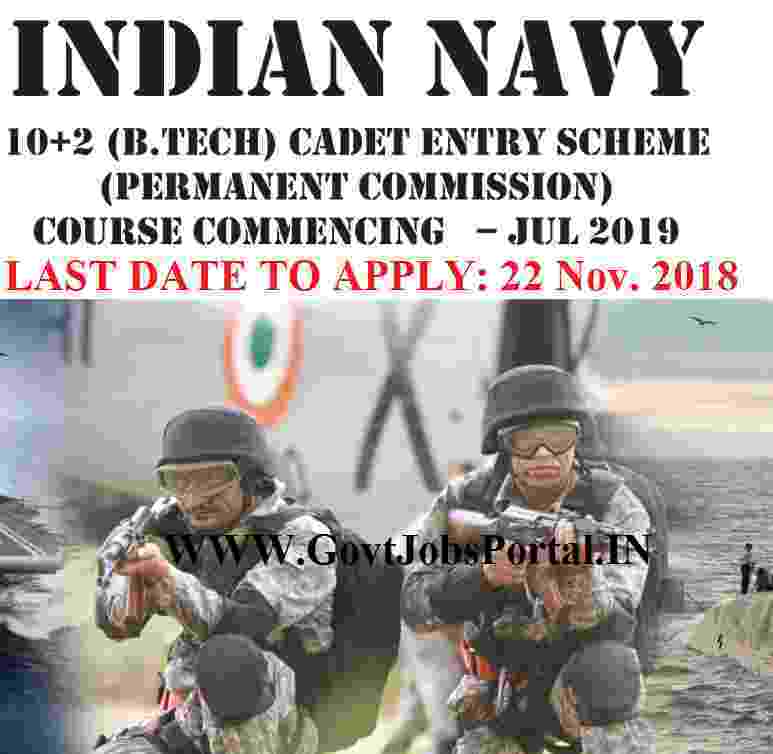 Those who are wishing to apply for this Indian Navy Recruitment process 2019 need not to pay any fee. As the Indian Navy is inviting all candidates to apply online for free of cost. 3RD Nov. 2018 is the Opening Date to Apply. How to Apply: Concerned Applicants have to apply online through the official website of the Indian Navy. We share the direct link under IMPORTANT LINK section for online Application. You can also follow the following link: “https://www.joinindiannavy.gov.in” . The link will be active on 03.11.2018 and remain activated up to 22.11.2018. Procedure for Selection: Selection will be based on SSB Interview.